Andrew Marin's life changed forever when his three best friends came out to him in three consecutive months. Suddenly he was confronted with the gay, lesbian, bisexual, and transgender community (GLBT) firsthand. And he was compelled to understand how he could reconcile his friends to his faith. In an attempt to answer that question, he and his wife relocated to Boystown, a predominantly GLBT community in Chicago. And from his experience and wrestling has come his book, Love Is an Orientation, a work which elevates the conversation between Christianity and the GLBT community, moving the focus from genetics to gospel, where it really belongs. 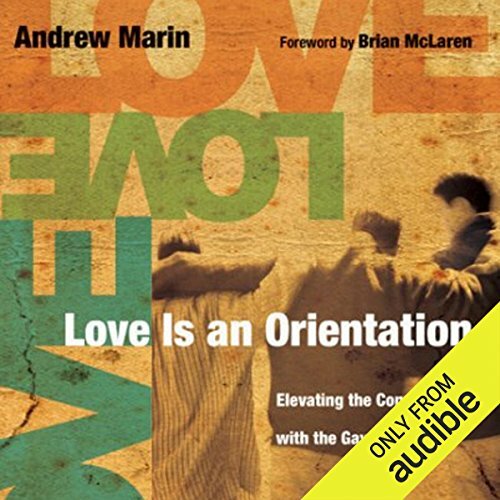 ©2009 Andrew Marin (P)2014 Audible Inc.
Food for thought that I desperately needed. I believe there's so much to this issue, and I really just want to understand and be loving to whomever walks my path. I believe this book opened my eyes some more to see just how much I fail at that but also how to strengthen those areas. This book just feels like a must read.